Flag an arms officially adopted 19 December 1981. Description: Flag horizontally divided red-yellow-red (1:2:1) with the national coat of arms shifted to the hoist. Use: on land as the national, civil and war flag, on sea as the national, civil (mostly, without the coat of arms) and war ensign. The flag of Spain is made of three horizontal stripes, red, yellow, and red, the yellow stripe being twice wider than each red stripe". The State flag and the State ensign must bear the national coat of arms, while the civil flag and the civil ensign may or may not bear it. In practice, the flag with the coat of arms is almost universally used as the civil flag, while the flag without the coat of arms is almost universally used as the civil ensign. The coat of arms of Spain, in its legal design, can be incorporated to the yellow stripe. The coat of arms of Spain shall appear in all flags referred to in Paragraphs 1, 2, 3, and 4 of the next Article. 1. The flags displayed outside and inside the seats of the State Constitutional organs; outside and inside the buildings and establishments of the State Administration at the State, institution, Autonomous Community, province, island and municipality level; on military public buildings, barracks, vessels, aircrafts and all other establishments of the State Armed Forces and of the State Security Forces, as well as used by the authorized units of the two Forces; on the buildings of the diplomatic missions and consular offices, the residences of their heads, and, if any, their official means of transportation. The coat of arms of Spain shall be in height 2/5 of the flag's hoist and applied on the two sides of the flag, in the center of the yellow stripe. When the flag of Spain features the usual proportions, in length 1.5 the height, the axis of the coat of arms shall be distant from the hoist of one half of the flag's hoist. If the length is smaller than usual or the flag is square-shaped, the coat of arms shall be placed in the center of the flag. Some careless sources, for isntance Banderas y Escudos del Mundo [a8m86], erroneously show the flag with the coat of arms centered. The flag, unfortunately, does exist in the cloth, and was even used in an official instance. The tennis player Rafael Nadal was presented as the standard-bearer for Spain at the London Olympic Games (2012)Olé, 27 April 2016, reports that the tennis player Rafael Nadal was appointed . The photo attached to the article shows smiling Rafa holding the flag at the Spanish Olympic Committee. The flag, however, has the coat of arms centered (RTVE, 14 July 2012). Nadal eventually did not attend the London Olmypic. The alternate flagman, Pau Gasol, marched with a correct flag. The flag with the coat of arms is almost universally used as the civil flag; the flag without the coat of arms is some sort of optional civil flag, simply out of factual use. The Flag Act of 1981 does not clearly differentiate between a civil ensign with coat of arms and one without - the civil ensign may or may not bear the coat of arms. Almost all fishing boats, passenger ferries, merchant ships, trawlers etc., however, fly the flag without the national coat of arms. 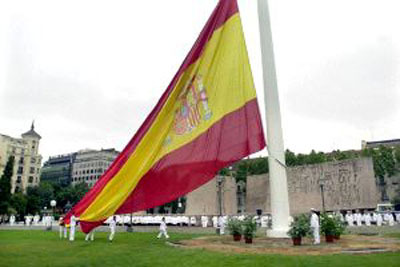 The General Headquarters of the Spanish Navy confirmed that the use of the flag with the coat of arms is not forbidden by any legislation (Royal Decree No. 2,335, adopted on 10 October 1980 and published on 31 October 1980 in the Spanish official gazette, No. 262, pp. 24,276-24,277 [text]; aforenemntioned Law No. 39 of 28 October 1981). - as Zapatero's car flag. CIE stands for "Commission Internationale de l'&EAcute;clairage" (International Commission on Illumination). This organization has defined several colorimetric standards, two of which are the CIE Lab and the CIE 1931, or Yxy. Both represent colours as the coordinates of a point in a three-dimensional space, in terms of three primary colors, just as the RGB or the HSB computer standards do. All of these systems use different coordinate axes, however. In the Lab system, L is the luminance, or brightness, of the colour, and a-b are coordinates in a plane. This also can be expresed in polar form, as hue (H) and chroma (C), leading to the HCL specifications given for the Spanish flag. In the (year) 1931 standard, Y is also a kind of luminance, and x-y are again coordinates, in a different plane. There are conversion tables as well as an on-line utility to make the conversion between the CIE standards and RGB. The basic design of the Spanish flag is one of twelve proposals of new war ensign designed in 1785 upon request of King Charles III. The king wanted to further differentiate the Spanish war ensign (up to then plain white with the Spanish arms in the centre) from those of other European countries (mainly Bourbon-ruled ones as France, Parma, Tuscany or Two Sicilies but also the British White Ensign), in order to avoid confusion at sea. From those twelve proposals, it becomes apparent that red, yellow, white and blue were preferred to other colours. It is not clear, however, that the reason to choose them was to keep the traditional, heraldical hues present in the Spanish arms. It is probable that cost of the material, ease of production and long distance reconnaisance capability played a role as important, if not much more, than tradition. - National flag (with the current coat of arms), Royal Decree, 1981. In 1981 the eagle disappeared from the Spanish national flag, leaving the current red-yellow-red flag with crowned arms (greatly simplified, including a small oval in the center with three fleurs-de-lis). The crowned pillars flank the shield. An image on a flag, be it heraldic arms or something else, should always face the same end of the flag on both sides of the flag, so if it faces the hoist on the front side, it should face the hoist on the reverse side of the flag too. On the front side of the Spanish flag is of course the coat of arms as we are used to know it, with the heraldic right side (dexter) towards the hoist (in this case with the arms of Castile nearest the upper hoist corner of the flag). On the reverse side the arms should therefore, as is shown in the photo, be reversed, so what we see is a mirror image of the arms � with the arms of Castile nearest the upper hoist (photo, flag hoisted in front of the Senate - PC Week, No. 458, 9 December 1999) and reversed lettering for the motto. Television reports, 19 July 2000, showed the Spanish prime minister JoséMaría Aznar speaking at a press conference in Nouakchott (Mauritania). Behind him was a Spanish flag showing the reverse, in which the coat of arms was clearly visible. To my surprise, the motto ("PLVS VLTRA") had been written so as to be legible, but each bit on its own � so the motto (on the reversed arms) read "VLTRA PLVS." This may be only a manufacturer's design (the arms were not fully an official version, for instance the lion had a more heraldical attitude and a very purplish shade, and the chains of Navarre were more squarish), and the flag might have not even been produced by a Spanish manufacturer (something probable if the press conference was taking place outside the Spanish embassy). A vertical Spanish flag is hoisted from a staff with horizontal bar in the port area of Los Christianos, La Gomera (Canary Islands). The flag, in proportions 3:1, is vertically divided red-yellow-red (1:2.1) with the coat of arms at the top of the yellow stripe. The largest Spanish flag displayed on land (14 m x 21 m; 264 sq. m; photo) has been flown permanently at Plaza de Colón (Columbus Square), central Madrid, since October 2002 (presentation). The jura de bandera takes place every year when Spanish youths end military service. This is not reserved to them however, and any Spaniard can request attending the ceremony and taking part in the oath. Citizens are not otherwise sworn in to the flag. This is most relevant, as compulsory military service will disappear in Spain in the short term. The national anthem (a Prussian score called Marcha Granadera - Grenadiers' March, a gift from King Frederick the Great to King Charles III) is usually played - but not necessarily - when the flag is present and/or raised/lowered. There is no current official lyrics for the anthem.